AniMaybe: Anime Survivor: Spring '12 - Second Place! Selling Points: If we've made it this far, there probably isn't much to sell you on Tsuritama, but I'll make my pitch. Tsuritama was meant to be the lesser of the noitaminA twins this year—fandom was much more exuberant about the Shinichirô Watanabe/Yokô Kanno reunion in Kids on the Slope than its normal-looking little brother. While I regret not including the other and making this competition into a heated sibling rivalry (pretty sure Kids on the Slope would have at least made it to the Top 3), I was also skeptical—we just suffered two dreadful seasons of Guilty Crown, and Black Rock Shooter doesn't sound like it was any better. Despite all the talk about dragons, goddesses, aliens, mysterious organizations, and the Bermuda Triangle, at the heart of Tsuritama lies Yuki Sanada, a character that's a bit more real than people may realize. A quarter French and living with his grandmother, Yuki joylessly roams from school to school, insecure and uncomfortable in his ever-changing environment to the point of visibly drowning in tension. He doesn't see much fun in the long drive to Enoshima, and the nerves return in his first day of class. However, Yuki finds out he's not the only transfer student in Enoshima that day. A boy with a cheerful disposition and a weird command over water named Haru immediately declares himself to be an alien in front of his class. He forcibly moves into Yuki's new home and begs the boy to start fishing. Add to the mix Natsuki, a temperamental young fishing expert that warms to the idea of being their instructor, and Akira, a half-Indian, half-Japanese, all-secret-agent-and-owner-of-the-baddest-duck-mascot-since-Alfred-J-Kwak, and you actually get a good set of characters. With this Fishing 101 class, however, comes an attachment to Enoshima's actual legends about a goddess ending the calamity of a five-headed dragon. It seems that something out in Enoshima's waters is making people act funny, and Akira's organization is convinced Haru's behind this "Bermuda Syndrome". Does it have to do with Haru's squirt gun and his desperate attempt to fish? Defense: At first glance, Tsuritama didn't feel like it was trying to market itself to a wider crowd. 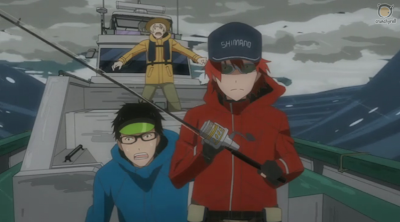 Already it had been branded as a noitaminA show, which likely turned off haters of the block, but its attempts to instruct the viewer on the finer points of fishing seemed to target only the fishing otaku. This approach at least targeted the foursome as the central characters, and fishing, much like the role jazz played in Kids on the Slope, became the adhesive. Visually, the show doesn't have as many artistic angles that shows like Dusk Maiden of Amnesia took this season, but the treatment of the show as something of an animated coloring book at least triggered some sense of childhood. Brighter colors and character designs by Atsuya Uki (Cencoroll), gentler movements, a recorder-filled soundtrack (all thanks to the "Kuricorder Quartet"), a bumblingly-adorable team of justice in squeaky rubber outfits, characters that had more fun smiling (or struggling to smile, Yuki's case)—this was a show that was a carefree kid on the beach that played through hurricane warnings. In general, it all comes back to the fact that the story directed by Kenji Nakamura ([C] - Control) and written by Toshiya Ono (Sweet Pretty Cure) became a fun venture. There were no real flaws in the storyline, and as the cast members grew out of their shells and learned that trust was just as important a skill as controlling your rod, it was hard not to like the unit they had become. The supernatural disaster and a potential missile crisis added to the volatility never really felt like a threat, and that left you feeling good about the cast. Of course, the duck helps. Final Decision: To leave Tsuritama out of the top spot was a brutal decision, but it likely came down to the last episodes of both this and The Woman Called Fujiko Mine. 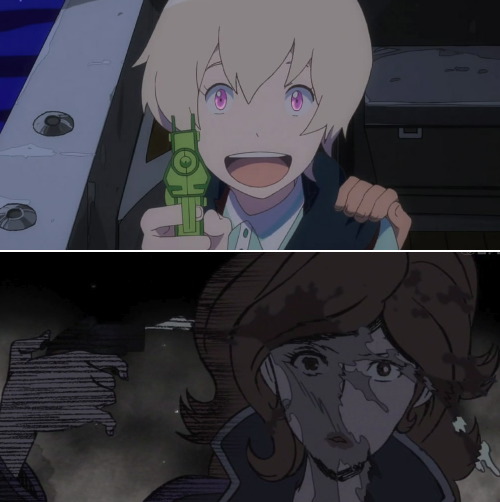 Basically, it was a general battle between comfort and contortion—while Fujiko Mine had to bend backwards to close as many loopholes in its premise as possible, all the crew in Tsuritama had to do was catch the bad fish. Granted, without spoiling too much, the heroes saved the day with a bit of a risky move that paid out in the end, but there was no unrealistic way that this show was going to end on a sad note, and that made it uncomfortable to choose Tsuritama. If I wanted a happy end that slithered out of the sad goodbye, I would have watched Dusk Maiden of Amnesia for that sort of audience trolling. Does yelling "Sayonara!" not have any meaning any more if the departed come back? 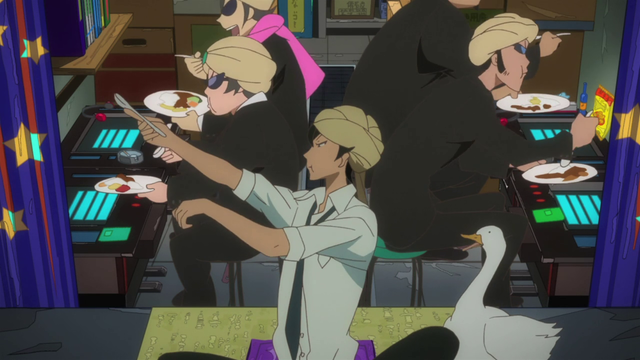 Because the show ended on a predictable note, I have to deny it first-place, but I'm willing to crown Tsuritama with a folded newspaper pirate's hat in honorable mention. It may not be the best show out there this season, but considering all the adult situations flirting about the Fujiko Mine show, Tsuritama was, by far, the best show you could have shown your kids this season, if not in the past few years. Hey, if you enjoy the hobby and the competition, a second-place catch is just as good as the top prize! Next time: It's over! Finally! So what was so great about The Woman Called Fujiko Mine anyways?